I am a native Coloradan, born in Durango but raised in Oklahoma City. I'm a daughter, wife, mom, "GrandBee", world traveler , former congressional staffer, interior designer and artist! I graduated from the University of Oklahoma with a major in History, but I my heart was always in Art. I taught children's art classes for several years and I am now venturing out as a professional artist. I worked in watercolor for many years and dabbled in acrylic. I even took a year of oil painting classes at the Art Students League of Denver. 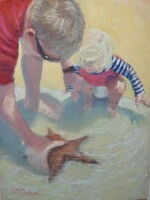 It wasn't until I took my first pastel workshop in May of 2011 where I instantly knew I had found my medium. It was love at first stroke! 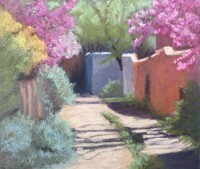 Over the last several years I have taken dozens of pastel and plein air workshops with the best pastel artists in the world today: Albert Handell, Richard McKinley, Mike Beeman, Barbara Jaenicke and Liz Haywood-Sullivan to name a few. Many of my painting subjects come from the lands where I grew up. I call the areas between Denver, Santa Fe and Oklahoma City my "golden triangle". We live in Santa Fe, NM several months of the year and the inspiration I find in Santa Fe, Taos, and most of Northern New Mexico is perhaps my greatest painting joy. The Colorado High Country and snow scenes have become a particular favorite as well. I have been told I'm a "zoom" in artist and I usually select a small vignette of a larger landscape to focus on. I have a beautiful home studio in Golden, CO, as well, where I paint from still life and work from photo references. But, my favorite place to paint where I think I do my best and most spontaneous work is outside painting "in plein air" . I hope you will follow me on this "Third Chapter" of my life. I believe I'm finally doing what I was meant to do and my goal is to capture and share the beauty I see in the world everyday.